One of the biggest Boxing fight in April 2015 will be between Danny Garcia and Lamont Peterson which will take place in the Barclays Arena in Brooklyn New York. This fight is part of NBC boxing championship and will be the main event alongside another big fight on the night between Andy Lee vs Peter Quillin for the Middleweight title championship belt. 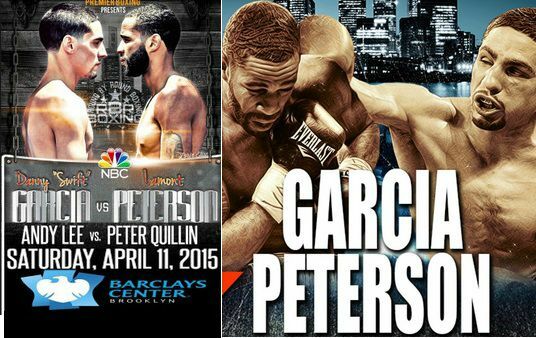 Garcia-Peterson will be shown on NBC sports network channel on 11 April 2015 for the NBC “Premier Boxing Champions” event. Apart from these two fights boxing fans can look forward to a very solid undercard which has been confirmed going into the last two weeks of the fight night. One of the undercard fight include 2008 Olympic gold medalist Felix Diaz taking on hometown fighter Gabriel Bracero for the super lightweight a 10 round fight. There is another quality fight too look forward to in Marcus Browne vs Aaron Pryor Jr while colombian boxer Samuel Vargas will take on former US olympian Errol Spence Jr.
Luis Collazo, the home town favourite will also be fighting on the card but his opponent is yet to be revealed and in what is a very action packed undercard boxing fans will see the glimpse of highly rated Viktor Postol as well. Here is the full list of fights to be shown on the undercard of Garcia vs Peterson on 11 April 2015.